What do Gwendolyn Hopkins of Nottingham, Diane and Jenny of Bedford, Jill, Janet, Mary, Brenda and Lynn from Wakefield, Carolyn Hill and Jane Richards from Bognor, Ronnie Yates at Liverpool Institute, Irene and Sandra Lennon (no relation), Gillian Archer and Patricia McClain have in common? 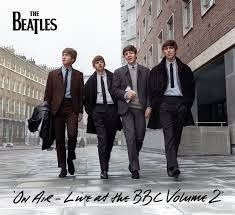 Their names are amongst those read out by John, Paul, George and Ringo on The Beatles On Air - Live At The BBC Volume 2 which I listened to a lot as I commuted last year when it first came out. They were some of the thousands of fans who wrote in to the BBC’s Light Programme requesting songs to be played by the group on Saturday Club, Easy Beat, From Us To You, Top Gear and Pop Go The Beatles, regular appearances on which were everyday occurrences for the group during the early phase of their career. And although it’s possible to detect a hint of cynicism in the voices of John, George and Ringo (but rarely Paul), they take it in their stride. This, after all, was what it was all about in the years when a joint was something that held two pieces of wood together and summer seasons in Weston-super-Mare, Llandudno, Bournemouth and Southport were part and parcel of being Fab in 1963. This is the second 2-CD volume of BBC recordings by The Beatles but try as I might I can’t get over the feeling that it’s the sequel to the sequel of the real thing and as such is far from essential. Because they set such an absurdly high standard on the studio versions of the original songs on this album, the versions here are invariably inferior to when George Martin and his team were setting the sound levels, and the same applies to those cover songs not included in their Parlophone sixties output, many of which also appear on the first BBC collection. In fact, there are just two ‘new’ songs here: ‘I'm Talking About You’, the Chuck Berry rocker that was a favourite with all the era’s beat groups, and, less predictably, ‘Beautiful Dreamer’, the Stephen Foster ballad from the mid-1800s here given a rock’n’roll treatment and sung by Paul. Versions of every other song, 37 in all, been released before. These complaints aside, what does set The Beatles apart from the rank and file of their contemporaries is the quality of the vocals, John and Paul especially, and the way that pre-conditioned assumptions – like Paul’s best on the slow ones and John on the rockers – are turned on their head. Paul is great on the rockers, his ‘Hippy Hippy Shake’ trashing The Swinging Blue Jeans and his ‘Long Tall Sally’ almost on a par with the studio version, while John sings with enormous sincerity on some of the slower songs, beat ballads like ‘Anna (Go To Him)’ and their own ‘Ask Me Why’. Instrumentally, though John’s rhythm guitar is barely heard, George does sterling work throughout and Paul’s bass occasionally leaps out of the speaker with the kind of oomph that doubtless set the Cavern alight. Two final points. Included on the end of the CDs are eight-minute interviews with each member of the group, conducted by Brian Matthews (referred to by John as ‘Brian Bathtubes’) towards the end of 1965 and beginning of 1966, in which all four give thoughtful answers to sensible questions, and herein we see glimpses of the future: John’s struggle with class issues, Paul’s avant-garde leanings, George’s quest for something a bit deeper and Ringo’s apparent boredom. Finally, for the first time ever, there’s a Universal Music logo on a Beatles record, and no sign of EMI anywhere. For me, who’s been buying Beatles records since 1963, this was a bit like buying Weetabix in a Kellogg’s packet.